MosquitoCon 26 Trophy Sponsorships Available! Want to sponsor a trophy package at the upcoming MosquitoCon 26? 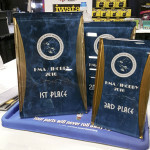 Check out the Trophy Sponsors page and see what we have still available. We’ll try to get everyone the categories they want, but it’s first come, first sponsored! The MosquitoCon 26 Contest Entry Form has been added to the MosquitoCon 26 page. This is a “live” form that can either be printed as-is and filled out by hand, or the information can be entered on the computer and printed. The form can be downloaded by clicking the image to the left, or downloaded from the MosquitoCon 26 page.